The Farm Shed East Coast Wine Centre is at 53 Burgess Street, Bicheno. It is open Thursday-Monday 10-5 during summer. The Farm Shed East Coast Wine Centre at Bicheno is THE place to discover the wines from all the vineyards in Tasmania’s East Coast Wine Region. Every day, a selection of five wines is available for guided tastings and to enjoy by the glass. It also houses the local Post Office. Wines are available for sale by the bottle, by the case or in mixed dozens, all of which can be shipped to customers’ homes at very reasonable rates. 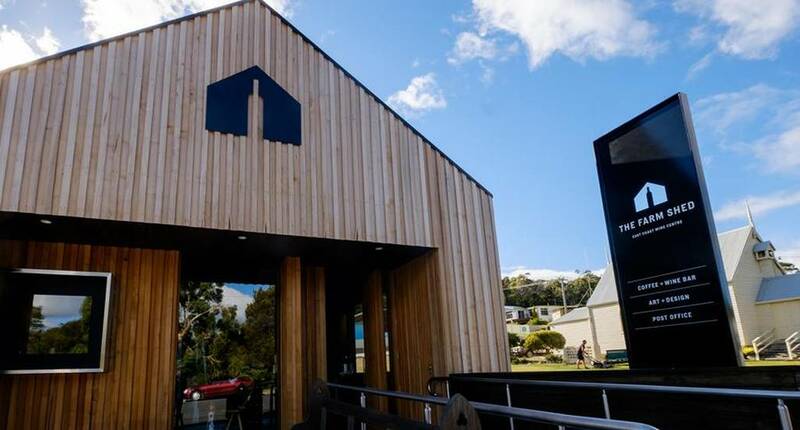 Proprietors Subi Mead and Helen Bain believe The Farm Shed is the only wine centre in Tasmania that exclusively promotes the wines from its own region. “We have lived on the East Coast for almost twenty years, and the wines of this region have become our passion,” says Subi. The inspiration for The Farm Shed goes back to a holiday twenty years, when the pair drove their campervan from Hobart to Margaret River. They were impressed by a modest weatherboard cottage in Cowaramup, stacked full of cartons of local wine, topped with torn box lids scribbled with vineyards and prices. This memory of the Margaret River Wine Centre stayed with them and in part, inspired The Farm Shed. Guided tastings of each day’s selection are accompanied by the often fascinating stories behind the vineyards and wine makers. Interpretive material (more highly designed than those torn box lids, but reflecting the same commitment and passion) offers information on the wine region and each vineyard to those who prefer to simply wander and browse. The Farm Shed’s range of regional spirits has grown in similar fashion, from 4 gins and 2 whiskies to 17 gins and 15 whiskies, also available for guided tastings. The Farm Shed’s website now boasts an online shop, which visitors use to replenish supplies of their favourite drops, often discovered while visiting on holiday. Visitors can also browse carefully curated art and design by local makers, and make use of what has been described as Australia’s best Post Office – how many offer wine tastings with their stamps? The Farm Shed is participating in the Southern and Eastern Open Vineyards Weekend on March 2-3 and will be featuring the smaller vineyards of the East Coast that don’t have their own cellar door – a great opportunity to discover some of the region’s lesser-known vintages.